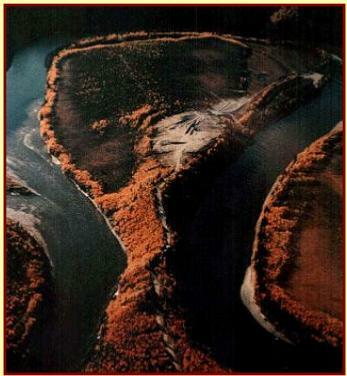 This ground consists of 23 miles of dredging leases covering the river bed between the high water marks of the banks from the confluence to the Alaska border. 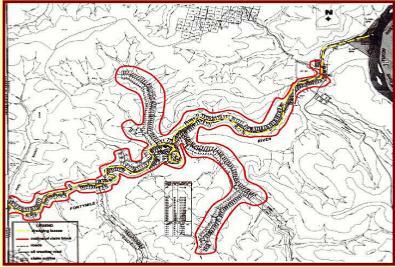 The location of the dredging leases is shown on Map 3 - Claim Sheet 116C-7. The bulk of minable gravel is contained in a series of over 30 distinct river bars exposed after the spring break-up flood has receded; several of these bars have vast reserves each containing in excess of 1 million yards. Gold is found throughout the gravel section with the greatest concentration on bedrock. Depth to bedrock on the gravel bars ranges from 10 to 18 feet. The floater dredging method has many advantages: because the gravel processing plant moves to the gravel (as opposed to moving gravel to the plant), mining costs are minimized, the dredge pond also acts as a settling pond, further reducing costs, the operation has total water recirculation so that there is no process water discharge to the river, and reclamation costs are minimal. We hold 279 claims on the main stem of the Fortymile River. The location of the claims is shown on Map 3 - Claim Sheet 116C-7. These claims cover the majority of the minable gravels fronting the river. The terrace gravel reserves are contained in the ground adjacent to and above the high water marks of the river banks. These reserves are situated in distinct and individual benches varying from 10 to 600 feet above the river. The terraces have been incised by the water course, leaving canyon-like walls on one side of the river and the terrace ground on the opposite side. These gravel deposits contain very large quantities of gravel; a typical bench can contain several million yards of placer gravel. Marten Creek - We hold 52 claims on Marten Creek, a left limit tributary located approximately 15 miles upstream from the mouth of the Fortymile. Marten Creek, also known as Log Cabin Creek (because of the remains of many miner's cabins located on it) is a narrow, swift flowing creek with a main stem of approximately 4 miles in length. This creek is reported to have been a significant coarse gold producer in the early days. There is evidence of extensive hand mining work on the creek. We started mining in Marten Creek late in the 2011 mining season. We installed our floater dredging equipment close to the mouth and began working upstream. The ground is producing well. The gold is coarse and the purity is 86%. Bruin Creek and Herbert Creek - We also hold 46 claims on the lower 4 1/2 miles of Bruin Creek, a right limit tributary located approximately 12 miles upstream of the mouth of the Fortymile. Bruin Creek is a large creek with a mainstem of approximately 10 miles in length. This section of the creek is located in a relatively wide valley. We estimate that it contains approximately 3.2 million yards of dredgable placer gravel, with additional reserves on terraces. A dredge operated there in the 1930's, successfully recovering placer gold. A portion of the Bruin Creek holding consists of a block of an additional 28 claims covering a tributary gulch known as Herbert Creek; this left limit tributary gulch joins Bruin Creek approximately 4 miles upstream from its confluence. Herbert Creek was very active in the early days with claims staked from its mouth to its headwaters. There is much evidence of hand mining. 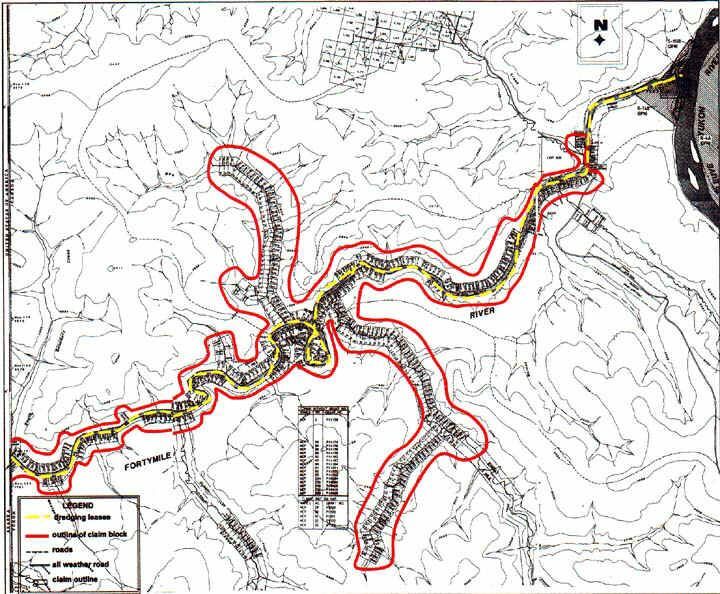 The claims on Marten Creek, Bruin Creek, and Herbert Creek are shown on Map 3 - Claim Sheet 116C-7. We would like to discuss our holding with a party interested in initiating large scale placer production. We would prefer to sell the property as a contiguous unit, retaining a small royalty, but would consider other proposals. If you are interested in the property, please contact us. One of our mining cuts on a terrace in an oxbow bend in the Fortymile River. 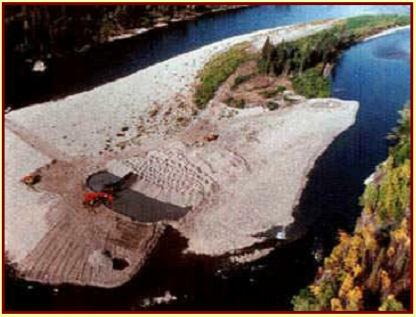 Fortymile Placers' dredging operation on Sourdough Island, a Fortymile River gravel bar. All of the right hand side of the bar has been mined and restored. 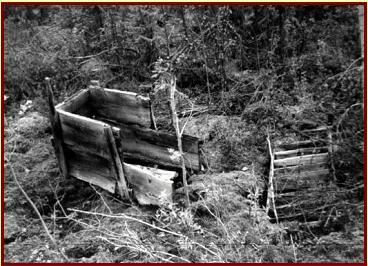 The remains of this old rocker and set of wooden riffles was found in Herbert Creek, tributary of Bruin Creek. Herbert Creek, noted for production of coarse gold by hand miners, has never been mined with modern machinery. 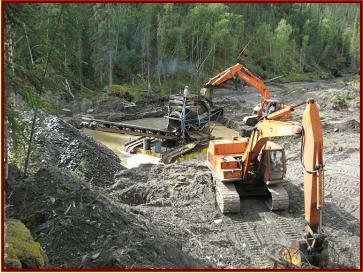 Processing placer gravel in Marten Creek using a floater dredge in the 2011 mining season.